Many yoga mats on the market last for a long time. But they may wear out after extended use, and will need to be replaced. If you're in the market for a new yoga mat, think about "going green" and choosing an eco-friendly yoga mat. Eco yoga mats are made of material that is biodegradable under the right circumstances, are made of safer, sustainable materials compared to the commonly used PVC yoga mats, and they reduce our carbon footprint on the earth. Why Choose an Eco Yoga Mat? Are you in the market for a new yoga mat? Consider choosing an eco friendly option over the more commonly available imitation rubber PVC (polyvinyl chloride) yoga mats. Highly toxic byproducts are produced during the production of PVC, including dioxin, a potent carcinogen. Toxic chemical stabilizers need to be added to PVC to make it usable. This is my mat of choice and I love it! 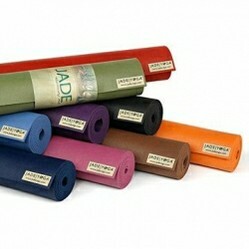 The Jade Harmony Yoga Mat is made of open-cell natural rubber, and is durable and very slip-resistant. It's easy to clean by wiping it down with a mild soapy solution. I like its extra heft and the way it lies flat, compared to the common PVC yoga mats that shift, wrinkle or roll up during use. The only minor drawback that I experience is that it's heavy to carry around. I've used this mat for about a year now, and it has shown no signs of wearing out, compared with a closed-cell natural rubber yoga mat, which started degrading within a couple weeks of use. Read an in depth review of the Jade Harmony Professional Yoga Mat. 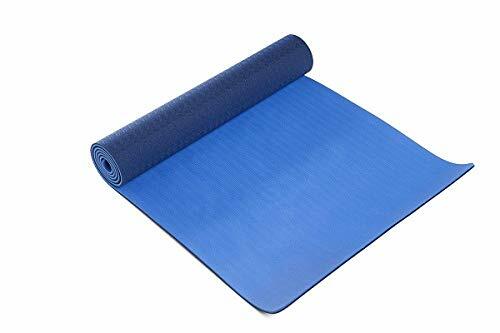 While in my opinion the natural rubber yoga mats are the most eco-friendly and useful mats to use, I also know some people are sensitive to latex and rubber, or may just not like the initial rubber smell or feel. There are other good non-PVC yoga mat choices if a natural rubber yoga mat doesn't work for you. TPE (ThermoPlastic Elastomer) and PER (Polymer Environmental-friendly Resin) yoga mats are good eco-friendly choices. 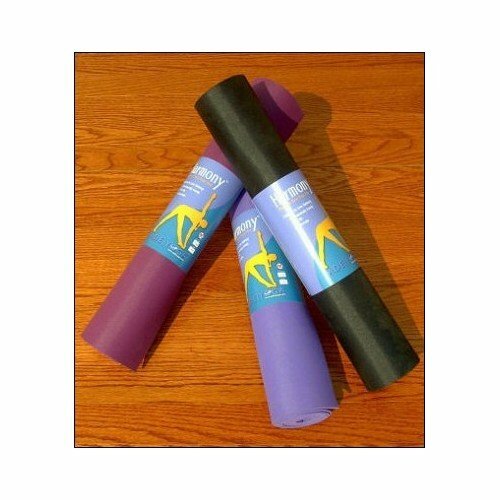 TPE (ThermoPlastic Elastomer) yoga mats are non-toxic and latex-free. They're lighter than natural rubber mats, and somewhat less expensive. I bought 15 TPE yoga mats for use in my studio, and many of my students prefer them over the regular yoga mats I have because they're thicker and give better padding. The only complaint is that the mats can be a little slippery, but then we learn to hold the poses better with our muscular action rather than relying soley on the mat. The ones shown here come in a wider variety of colors. PER (Polymer Environmental-friendly Resin) yoga mats have a similar feel to PVC yoga mats, but without the toxic emissions during production that PVC has. The cost is also similar to PVC mats, making them less expensive than natural rubber or TPE yoga mats. PER yoga mats are non-skid and easily cleaned. 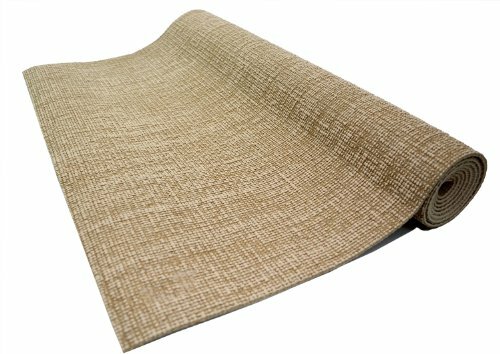 The PER yoga mat shown here is reinforced with natural jute to give added strength. What if You Already Have a PVC Yoga Mat? If you've been practicing yoga for some time, chances are you already own and use a PVC yoga mat. So what do you do? Personally, I think it's fine to keep using your PVC mat as long as it's in good condition. Throwing it in the garbage just adds to our landfills, and it will slowly leach out toxic chemicals. Some recycle centers may accept PVC but many still do not (ours does not). If you're through using your PVC yoga mat for your yoga practice, you could re-use it around your house, yard, and garage. Good yoga gym bags and tote bags for carrying your eco-friendly yoga mat and other gear for class or for the gym. Here are some of the highest rated yoga bags and totes that I've come across. Great information and suggestions. Glad to find a fellow eco conscious writer. Well at least you pointed me in the right direction! I'm so glad you have eco-friendly mats on here! So important! Hi HerbivoreHippie, I'm glad you enjoyed that article -- although I didn't write that one :-) I thought it made a good reference article though, for people who wanted ideas for re-using their old yoga mats. I just read your "New Used for Old Yoga Mats" article...you are brilliant! I have an old one that has been replaced, why haven't I thought of putting it under the dogs' food bowls? They have those bowls that are not "suppose" to slip but they find a way to push them all around and make a mess. Thanks for the idea! Why does everything have to be so darned environmentally unfriendly? These new mats sound like winners. I would say put the old one in the garage and get a new one that isn't so unhealthy. Good information on this page!